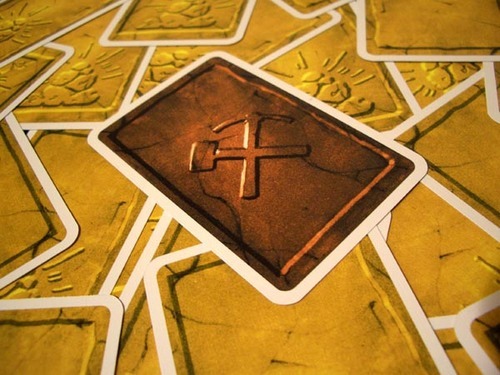 Create a route reaching the gold to make the Saboteurs lose. Trap diggers of the opposite colour, Profiteer, Geologist, Boss and Saboteur. Trap your partner of same colour or change his hat when the game almost end to cut the amount of winner. Discard cards with crystals so the Geologist will not get gold. Put cards with your door of your team colour (one good strategy: put them near to the end of the game). Make sure there is no door of other colour team blocking your way. Trap Profiteer, Geologist and Saboteur. Trap diggers or change their hats when the game almost end (make sure first that you can create route to reach the gold to cut the amount of winner). Put both colours of door (blue and green) and make sure you reach the gold, in this case you are the only player who wins with FOUR GOLDS (advice: put the second colour of door near to end of the game so diggers will not put block card on you). Prevent diggers from using ladder, but make sure the route will reach the gold. Do not place the final route to the treasure if there are no doors to block one of the gold digger teams (if not, there will be too many winners). Stop people creating a route reaching the gold. Discard route cards that will benefit gold diggers. Bluff others by helping creating the route at the start of the game. Use dead ends halfway or towards the end of the game. Use green door to stop blue digger. Use blue door to stop green digger. Trap all other players or change their hats except for saboteur. Trap other saboteurs or change their hats towards the end of the game to cut the amount of winner. Use Avalanche to destroy ladder/important route. If the gold is reached BUT there are two colour of doors to reach it, AND there is NO BOSS or the BOSS IS TRAPPED, you win. You will win if the green digger, blue digger or the saboteur wins. In case if there are blue and green doors built on the route to reach the gold, only the Boss will win. You will lose. If you are helping the diggers, make sure there is only one colour of door to cut the amount of winner. If there are too many gold diggers (incuding Boss), it is better for you to help the saboteur to win. If you are the only winner, you will get three golds. Will not win or lose, will only win gold up to the amount of visible crystals at the end of the game. Will not be counted among the winners. Put as many routes with crystals on it. Discard route cards (3 if possible) if there are no cards with crystals in your hand. Try to help build the route but more the sides (use curved route or single route with no junction but heads to the right and the left) so other diggers cannot help but need to use route cards with crystals. Try to help saboteurs if the route to the gold is too easy, because easy route will make there are less amount of crystal routes on the table. Trap the other geologist or swap his hat so you do not have to share geologist's money.